They have no access to shelter for when the temperature drops below 5 degrees, or the wind chill is below 5 degrees. The horse is old or really young – older horses need extra help to stay warm. Sometimes as horses get older it’s harder to keep weight on them no matter how much feed we give them. So if you have an older horse that’s not in good body condition put a blanket on them cause you don’t want them spending all their energy trying to keep warm. The same goes if you have a younger horse that is not in good body condition or needs extra help staying warm. The horse is skinny or ill. Older, skinny and ill horses have a harder time maintaining their internal temperature. The horse has been moved from a warmer climate into a colder climate and they haven’t had time to develop a good hair coat. 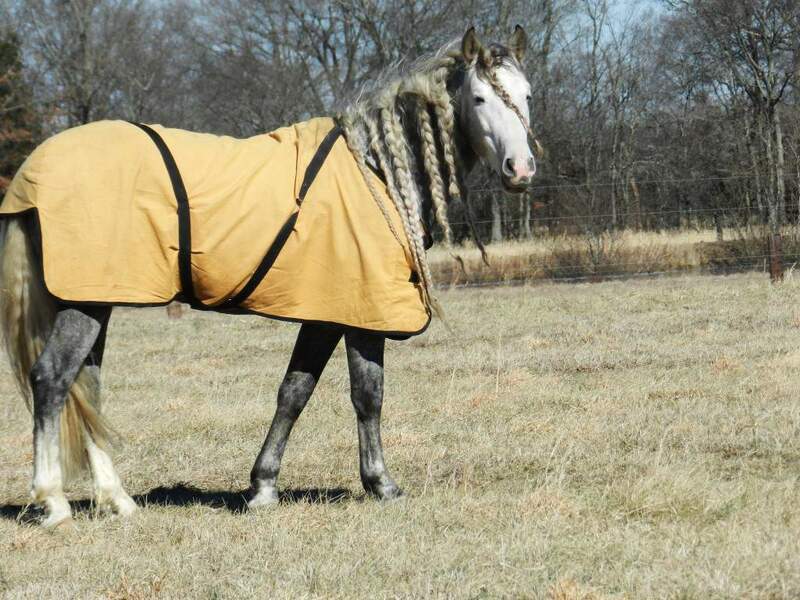 If your horse has been allowed to grow their winter coat and are in good body condition they don’t need a blanket. Horses prefer to be outside even when it’s cold and they’ll do well if you provide them with some kind of windbreak and access to a shelter. Horses have the ability to fluff up their hair which creates a warm layer of air around them and acts like a thermal blanket. When you put a blanket on your horse it flattens down their hair and reduces the insulating effect which makes them much colder. The same thing happens to a horse when their coat gets wet or muddy. If you have a horse that gets wet and muddy and you see them shivering give them extra hay to bring up their body temperature. Never put a blanket on your horse if they’re wet this will trap the moisture. Instead move them indoors and out of the wind. Giving your horse extra hay will warm them up from the digestion process which produces heat. So, if you know it is going to be really cold at night give them plenty of hay instead of putting a blanket on them. If you do blanket your horse and they are turned out make sure it’s a good turnout blanket that’s waterproof like the Kensington turnout and not water resistant. Water resistant will repel for awhile, but will eventually allow moisture to get to your horse. Make sure you remove the blanket daily and check them for cuts, sores or rub marks. You’ll also want to inspect the blanket for rips, tears and make sure there are no foreign objects attached to the underside. Also, make sure the underside is clean before you put it back on. You also need to make sure you can take the blanket off if the weather turns warm cause you don’t want your horse sweating. It’s really best to avoid having your horse wear a blanket 24/7 because they need to roll in the dirt it helps them to distribute the natural oils. If you blanket your horse what brand do you use I would love to know. Leave me a comment below.